After a long hike up the mountain trail, the characters were once again standing before Sohrab Khan’s keep. In the sunlight, it looked smaller and less menacing. Burzasp, under invisibility, snuck in to see if anyone was in. The passages were deserted, and everything lay as it had been left last time. Still, not missing an opportunity to explore the so far unpenetrated donjon, they headed for the room north of the dining hall, where the iron statue of a tiger stood watch over stairs going up to a second floor gallery. “This old stuff looks dangerous, ready to collapse.” – said Santiago. Not trusting the stairs (which were just in the way of the tiger), Vifranavaz threw a grappling hook up on the banister and climbed – to come back crashing down as the ancient woodwork collapsed under his weight. “It is safe now that Vifranavaz has found the weak spot.” – Burzasp took aim with the grappling hook, and climbed, pulling down another section of the venerable construction in a shower of broken wood and dust. The third time was lucky, though, as the rope held on what remained of the gallery. Looking around, and defeating a glowing-eyed undead sentinel who lay in wait with a scimitar, they emerged first on a terrace overlooking the surrounding lands. North of the pass, in the dust bowl, a procession of riders were coming towards Birtham – Sohrab Khan, returning from his fruitless hunt with his retinue. Another door lead to an abandoned suite, where there was little more than a few books (Zer Arnaz the Woman of the Sky; The Armies of Kahtoslan), and a handful of small semi-precious stones in a brass gridwork. The rest of the donjon proved even more vacant. They descended back down to the gallery, then down the stairs. There was a huge whoosh coming from the direction of the tiger statue, and the space before it, dry wood and all, was engulfed in a gust of flames. The rest of the gallery fell with a tremendous crash, blocking the double doors back to the dining hall. The fire spread quickly in spite of their best efforts, and they were quickly forced to choose an exit. Westwards was a mostly bare room; from the south came a different kind of whoosh, and six flying swords appeared in the doorway. The animated weapons proved to be formidable opponents, but Ambrosius held them off as the others retreated to the south, finding an exit from the inferno as Santiago also covered their retreat and hacked apart more of the flying opponents. They emerged, coughing and black with soot, in the courtyard. The donjon was starting to burn, and the flames spread quickly to the rest of the structure. Ambrosius was nowhere to be seen, but as the others were starting to lose hope, he appeared at last from the stables, wounded but alive. They saddled up and rode at a breakneck pace down the road, and indeed, saw a dust cloud approaching from the direction of Birtham. They turned east on the mountain path, while the keep burned and muffled, almost silent screams from its depths roared to the sky. Continuing until they could, they at last fell asleep exhausted among the mountains, fearing to even make a campfire. Next morning, Marasura got their bearings. This place was not far from where their camp was ambushed by the stone monsters last time, and recalling that a good deal of treasure was lost with their pack mule, they investigated the location. They looked down a sheer precipice into a rocky gorge with some stunted shrubs, vultures flying below them in lazy circles. The mule had already been picked clean, but the scattered equipment was still down there. Marasura descended the cliff face with stretches of rope the others tied together, and looked around the gorge floor. There was a sweet scent as blooming red poppies growing from the crags opened their petals. Among the equipment, near a shredded sack, a different sort of growth was beginning: small and now still weak flowers were bobbing in the warm wind, resembling half-formed red lips. Marasura swayed and his head swam. The scent of poppies was overpowering. He quickly covered his nose and mouth with a rag, and started collecting whatever might be salvaged. A female set of tiger warrior armour and some rich clothes which had survived the fall went up, along with Marasura. The vultures seemed disappointed, but kept a respectable distance. 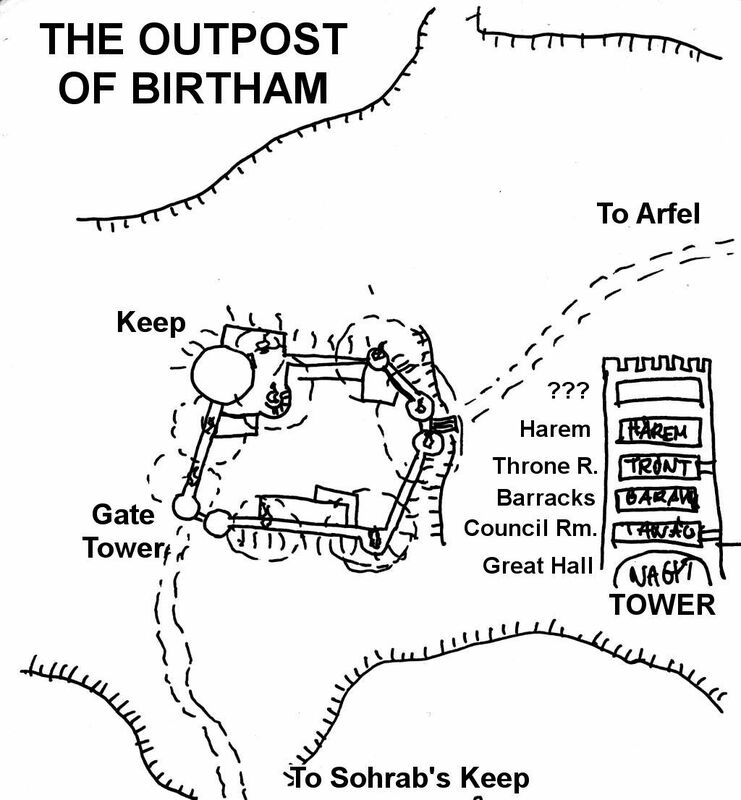 The next day, two travellers approached the gates of Birtham from the east. One of them was Marasura, having shaved himself, applied some makeup and donned the set of armour. The other was Vifranavaz, who had been invisible during the previous meeting with Sohrab Khan, and hopefully unrecognisable – or if everything failed, able to turn invisible again. They had with them an ornate scroll case, containing an intricate calligraphic letter stamped with the signet ring of the late Khojar Mirza and containing a message for the eyes of the Great and Glorious Sohrab Khan. They were hailed as they approached the walls, and a rasping voice inquired about their purpose. “It is I, Azarmidoktar, who is named the Polite Maiden! Open the gate, as we are messengers from the City – we hear from Kuraddin Mirza that the great khan Sohrab now resides among these walls!” – cried Marasura. The gates opened. The great courtyard was deserted in the heat of the day. A warrior enveloped in voluminous robes, none but his burning eyes visible, bowed deeply. 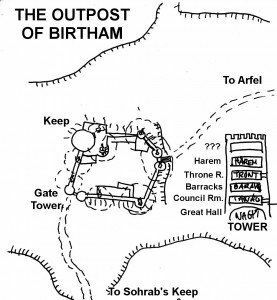 They went through the dusty place towards the donjon, through a gate and a mess hall, and up a spiral staircase until they were standing before the guarded doors of the throne room. Kafbar bowed again, then escorted them in. Sohrab Khan was sitting in Kuraddin Mirza’s wooden chair, his pallid face and white moustaches radiating with tension. Gulafshan Zer, standing by his side, kissed the old warrior on his cheek, then exited towards the harem. Sohrab Khan cast a dark glance at the emissaries, but after looking them over very carefully, made an old-fashioned bow towards “Azarmidoktar”. Brief introductions were made, and they explained that Baibars Khan, having made a great mistake but set right by the words of Kuraddin Mirza, was now asking for Sohrab’s forgiveness, and a formal visit to the City where all might be set right. The Khan’s eyes were inscrutable. He furrowed his brows, as if considering an idea, but there was a rap on the doors, and a robed servant appeared. “Could it be? !” – Sohrab sprang up and paced up and down. He looked at Marasura and Vifranavaz with something suggesting grim mirth – “It will soon be revealed if your intents are true, strangers. You shall not leave this room till I return.” He bowed stiffly, and exited the hall. Soon after the Khan’s quick steps faded, Ambrozius, Burzasp and Santiago returned to visibility, a carefully prepared ambush wasted. From the direction of the courtyard, horns sounded. Whatever happened, there was no time to lose. Vifranavaz and Marasura barricaded the entrance, while the others ran up the stairs to the harem. The luxurious suite was as before, but the previously locked door was now open. They ran up another staircase. This was the top of the tower, a smaller room flanked by tall and wide windows. Gulafshan Zer, clad in billowing blue robes, rose from a decorative bed, surprised by their intrusion. “We will save you, lady!” – exclaimed Santiago. “My love! There are traitors in the keep!” – the woman’s words rang with unusual clarity. The three descended upon her while she fought ferociously with the scimitar she had just picked up. Burzasp hurled a vial of holy water at her, and as the clear liquid hit her, it seemed to burn her skin like it was acid. Santiago held up the symbol of Karttekeza. “This sign has no power over me!” – she cried, and rushed at him. The battle was quick and horrible – she was both an excellent swordswoman and very strong – but three against one was too much. With a final reserve of strength, Gulafshan Zer tried to lunge towards a window and hurl herself to her doom, but Santiago hit her from behind with the back of his sword, and she sprawled on the floor, unconscious. Looking down at the courtyard, the calamity was apparently already noticed. The thin figure of the Khan looked up at the tower in disbelief, then yelled something they couldn’t hear, transforming into a red mist that sped upwards. They raced back to the throne room, where the blockaded door was already under siege from the outside. Quickly, rope after rope descended from the balcony to the keep. They descended in haste, curiously unmolested – apparently, Sohrab Khan missed this place, and went right for the top. Marasura, in a last-ditch gesture, set fire to the roof of the stables with an unseen servant. Below, on the ground, a thin, bearded figure in decorative robes arose: Kuraddin Mirza, Birtham’s previous master. He looked intently on Marasura, and he felt a crushing blow on his temples, as if he was ground down by the other’s willpower. He turned and fled, rappelling down the castle wall and disappearing in the wasteland where the horses were tethered. Original date 14 July 2012. Referee’s Notes: The (so far) final part of the small war with Sohrab Khan. To tell the truth, this segment of the campaign overstayed its welcome, since the confrontation went on too long between sides which could not genuinely engage each other. The party was too weak to go toe-to-toe with Sohrab Khan, who, on the other hand, was bound by a rather outdated code of honour, not to mention being in the unenviable position of having to defend himself against mobile and powerful opposition. In this finale, he was at least suspicious enough about the emissaries, but thought the characters trapped in the tower while he went off to receive Kuraddin Mirza – missing that there were extra invisible characters who had brought a whole lot of rope with them. The players, on the other hand, were just as surprised that sunlight did not seem to seriously deter the Khan – but to their fortune, this advantage proved to be too little to save the day.